In this pro-euthanasia melodrama, a successful doctor is forced to make a heart-wrenching decision after his beautiful young wife is diagnosed with multiple sclerosis. In 1894 France, a Jewish officer in the French Army is falsely accused of spying for Germany. A chilling tale based on a real event in which a doctor stepped out of line and sexually assaulted a patient when drugged. Rousing biopic of Paul Kruger, the Boer guerilla fighter turned statesman and first president of South Africa. Acclaimed Nazi euthanasia classic; often discussed, rarely seen. Hanna Heyt: [after willingly drinking an overdose of sleeping pills offered by her husband] Is this death? Professor Thomas Heyt: This is death, Hanna. 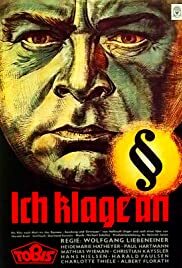 This is one of the best films made in the third reich with a credible storyline and very credible actors. On the other hand it is one of the most dangerous films containing poison that did not weaken in the 6 decades since its production. This film was intended as a preparation and secret promotion for hitler's euthanasia program. The plot(official, therefore no spoiler): A brilliant doctor's young wife falls ill to multiple sclerosis and urges him to kill her before the agony begins. Unable to find a cure he fulfills her wish and is accused of murder.This sounds like a dime novel but is based on real cases and presented in a very credible way(and I am allergic to sentimental films normally). This credibility and the fact that it is difficult to identify this as a nazi film by simple watching (a few seconds of cutting would remove all evidence) makes this film dangerous even today. The film asks the viewer for his judgement on the topic and even supplies him with possible objections but the answer is inevitable 'pro reo'. So this film could be used as ammunition in todays discussion about assisted suicide and its extensions (e.g. against the patients will if his resistance is considered as irrational by an authority as discussed in at least 2 western countrys). Therefore it (the film)is still banned in Germany except for scientific study. It's a pity, for it IS a very good film but I can't object the reasons.